Lewes Maritime Archaeology Project: Work in the wet lab, an improvised lab in a World War II artillery bunker at Cape Henlopen. A mid-Atlantic state on the eastern seaboard of the United States, Delaware sits against the Atlantic Ocean. Delaware Bay abuts the state to the northeast, while Maryland and the Chesapeake Bay lie alongside the state's southern and western boundaries. Water covers 535 square miles, which means almost 22% of the state is underwater. Delaware has no major lakes, but its major rivers include the Delaware River, Mispillion River, and Nanticoke River. Archeological surveys of Delaware's waters are incomplete, but based on the historical record, a number of shipwrecks from different time periods rest in state waters. Like most mid-Atlantic states, shipping played a significant role in Delaware's history from colonial times onward. Lewes Maritime Archaeology Project: Archeologists examine a millstone brought up during phase II excavations. The U.S. Army Corps of Engineers discovered one of Delaware's historic shipwrecks during a dredging project at Roosevelt Inlet. Research indicates this mid-18th century vessel might be the Severn, a British cargo ship bringing goods to the colonies. Archeologists have recovered almost 45,000 artifacts, which comprise part of the state collection in Lewes. Another well-known Delaware shipwreck is the HMS De Braak. On convoy duty off North America, the De Braak capsized in a squall off Cape Henlopen in 1798. The state has collected around 26,000 artifacts from this site and houses them in its collection in Lewes. Who takes care of Delaware's underwater archeological sites? The state has charged its Division of Historical and Cultural Affairs in the Department of State with stewardship of Delaware's archeological heritage, and the state claims title to all archeological resources on state lands, including subaqueous lands. 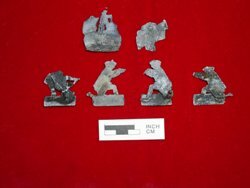 Lewes Maritime Archaeology Project: Zinnfiguren, or tin soldiers found in association with the wreck. Delaware requires permits for any archeological investigation on state lands. Applicants must establish that they are qualified, the study furthers the public interest, and it complies with any applicable management plans. The Division of Historical and Cultural Affairs issues archeological permits for the state, but other permits may be required from such agencies as the Department of Natural Resources and Environmental Control, the U.S. Coast Guard, and the U.S. Army Corps of Engineers. What laws are there about underwater archeology in Delaware? Laws related to archeology in Delaware are codified at Delaware Code Title 7, � 5301, et seq. These laws emphasize that the archeological resources of Delaware are an integral and irreplaceable part of the state's heritage, which should be protected for all citizens.